This 2004 Audemars Piguet watch is just waiting to become yours in a very deep, personal way. It is an “equation of time” watch, showing sunrise and sunset for your exact location, as seen in the video below. 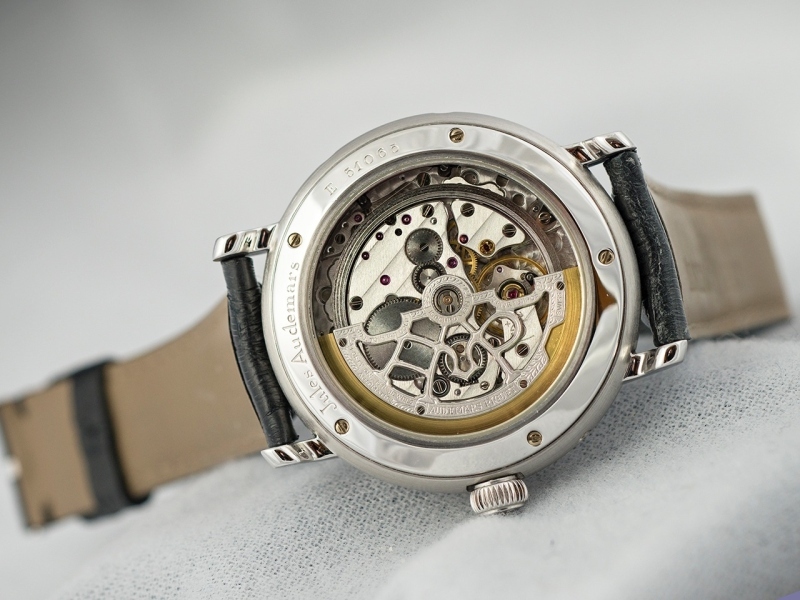 And it can even be personalized with your initials on the skeletonized rotor. What more could you ask? This is just a fantastic piece. First, it’s from Audemars Piguet, one of the great companies in historic and modern Swiss watchmaking. And, thankfully for some, it’s not a Royal Oak but rather a seriously complicated timepiece with perpetual calendar and moon phase along with the aforementioned equation of time function. But it’s the equation of time that gives this watch its name, so that’s where we have to start. As seen in the video above, sunrise and sunset varies dramatically around the world, and with it “true” solar time. This is the heart of the equation of time concept, which allows you to see just how far the “official” time in your location has drifted from what the sun says. The biggest issue with equation of time watches is not the calculation but rather the customization. As you can imagine, you can’t just produce an equation of time cam and be done with it. Rather, a watch company has to produce a special cam for each location around the world and be willing to swap out the cam as the owner moves. It would be impractical for the user to change cams on the fly (though an equation of time worldtimer would be totally cool) so instead reputable companies like Audemars Piguet offer a free (!) service to swap out the cam on request from the owner. So the buyer of this particular watch could leave it set for San Francisco or could send it in to have the cam switched for wherever he happens to call home. Want a watch even more personalized than that? Audemars Piguet will also replace the skeletonized automatic winding rotor with a new one featuring your initials! They’ll even swap out the dial and hands to suit your preference! 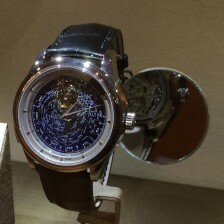 So this fantastic Audemars Piguet Equation of Time will become your watch in a way that few other timepieces can match. Inside is a really special movement. The AP 2120 was called “the most exclusive automatic” by none other than Walt Odets, and brings together four legendary companies. 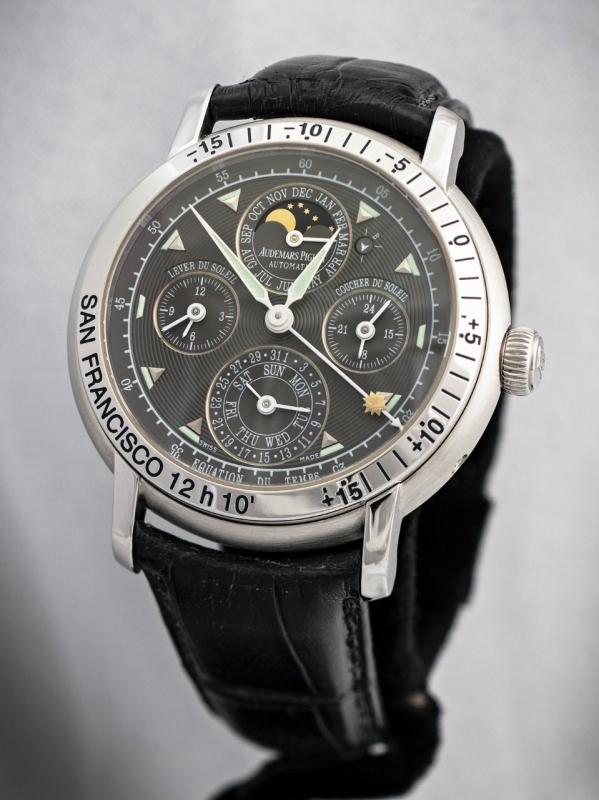 It was designed and manufactured by Jaeger-LeCoultre as the Calibre 920, but they never sold it in their own timepieces. Instead, they provided it, unfinished, to Audemars Piguet, Vacheron Constantin, and Patek Philippe, where it was used in many famous timepieces. This is a 2004 model said to be in excellent condition, presumably in the hands of the original owner. It is in white gold with an anthracite dial and luminous hands. It’s a very-wearable 39 mm and comes with everything – box, manual, winder (! ), and an AP carrying case and wallet. The seller is well-known and has a good reputation over at PuristSPro. Yours for just $34,900.